Following testing matches against Orient and Wrexham, the big question was could Town get their season back on track against Boreham Wood? Perhaps incredibly for a small commuter town flanked by Watford, St. Albans and the London Borough of Barnet, the Wood very nearly made it to the Football League last year, losing out only to Tranmere in the play-off final at Wembley. The town’s major claim to fame though is being home to both Elstree Studios and the joyless Eastenders, and while it’s fair to say that our visit provided drama galore, any comparisons to the long-running BBC soap end here, as this particular episode had a happy ending. Unbeaten in six league matches at home this season, our Hertfordshire opponents were certainly no pushovers, and when they took an early lead, Town could have crumbled. That they didn’t, going on to score four goals in the process, shows a team with fighting spirit and self-belief in abundance. With two forwards, two attacking midfielders and a goalkeeper on the bench, Town were never going to settle for a draw and, following an unfortunate injury to Lloyd Kerry, the fit again Jack Emmett duly entered the fray just before half-time to help change the course of the game. It was like he’d never been away as he almost set up a goal immediately with a typical burst from midfield, and the home team struggled to cope thereafter with his pace and directness. If Boreham Wood had been watching Town in the last couple of weeks, they wouldn’t have seen Emmett, so did he catch them unprepared? Overall though, it was a superb team performance from a unified squad of players that continues to defy the odds. They’re a team that deserves to be near the top of the league and, furthermore, one that’s perfectly capable of staying there. 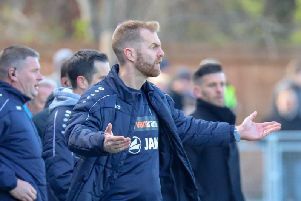 These are not my words, but those of Luke Garrard, the Boreham Wood manager, speaking after Saturday’s match. He may have just been talking about the team, but that ‘togetherness’ at Town exists both on and off the pitch.